Add Dinosaurs to Your Vacation and Roar! For more than a decade I have been posting news about dinosaur experiences, dinosaur exhibits, and dinosaur digs. I have noted the best places to view a Brontosaurs, Stegosaurus or T. rex and where to find the nearest Dinosaurs Alive! location. Each year I add more great options to the Dino Trips folder at the Family Travel Files. 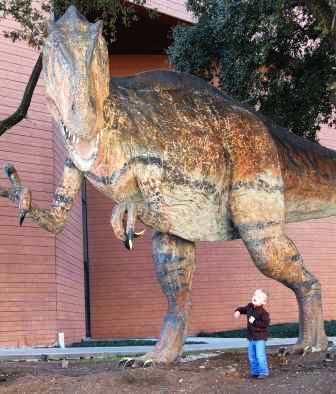 Roar with the dinosaurs at the Fort Worth Museum of Science and History. Adding a dinosaur or maybe two to your family vacation will guarantee squeals, roars, smiles and non-stop questions. Dino trips combine fun and learning with family vacation time. Seeing the biggest of dinosaurs and using big words to match is child’s play and meant to be shared. I recently discovered Connecticut’s Roar Tour, a terrific menu of vacation options which include old bones, dig for fossils, animatronic thrills, sharks, sea turtles, lizards. The Roar Tour also has vacation packages making a dino trip easy to plan. 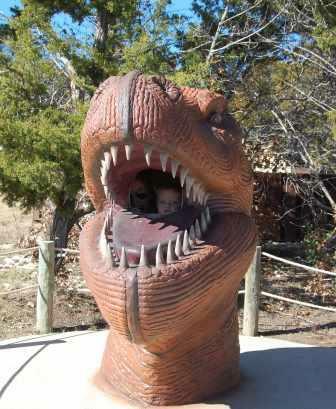 At Dinosaur World in Glen Rose, Texas tykes can hide in a dinosaur’s head and roar at passersby. If dinosaurs are on your radar screen this summer then get excited. Exceptional dinosaur experiences span the planet from awesome techno dinosaurs at Connecticut Science Center in Hartford and giant dinosaur puppets at the Los Angeles Museum of Natural History to Dinosaurs Live! locations and the enchanting pathways of Dinosaur World in Florida and Texas. The Royal Tyrell Museum in Alberta (one of my time favorite places to dig with kids) offers topnotch dinosaur experiences and T. rex Discovery Centre in Saskatchewan provides access to an actual dig site. The possibilities for fun and learning are endless. A complete menu of places to vacation with dinosaurs may be viewed in Dino Trips featured at the Family Travel Files. For the latest family travel, dino news follow The Family Travel Files on Twitter (@FamTravelFiles), Pinterest or Facebook straight from the homepage. As always I welcome feedback. Do you have a favorite dinosaur experience or place to roar? Just Tell Mom.